Synopsis: The Outdoor Aquatics Adventure Camp for 8th and 9th graders with challenging life experiences was accomplished by collaboration between Resident Physicians Erica Benthin and Andrea Bataan, in the UC Davis Communities and Health Professionals Together program; Rancho Cordova’s Police Activities League (PAL); Sacramento State Aquatic Center and AmeriCorps*VISTA Maura Reilly. 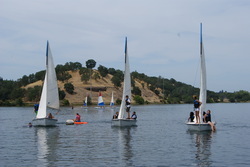 The focus of the camp was water safety and physical activity with youth completing the Aqua Smart water safety curriculum and participating in sailing, kayaking, wind surfing, canoeing and various other water and running games. The youth will be giving presentations on water safety to other kids in Rancho Cordova in the near future. Update: Thanks to our friends at the Rancho Cordova Police Activities League and the Rancho Cordova Community Partnership, the Outdoor Aquatics Camp will be going into it's third year in the summer of 2013! !